Our new team in Pacitan! Welcome to the new volunteers !! Already last year we carried out the recruitment of new volunteers in Pacitan. We welcome 16 new and old volunteers from Pacitan to the Project Child family. After a warm welcome and introduction round, the first workshop will take place in the next six months. Our Indonesian team in Pacitan will also be supported by Mia and Eliza from Berlin until the beginning of June. We look forward to a productive time together. This year, Project Childs main focus will be on water and the availability of clean drinking water for school children. The preparations for the new water program from Project Child are already on high gears and first successes can already be celebrated. At our location in Yogyakarta, a first water filter was installed in a primary school, which now gives access to clean and free drinking water to 145 primary school students. Eight additional water filters are already available in Pacitan and the search for schools in need along the coast line is in full swing. In addition, our team will soon begin the development of the accompanying educational program for the students so that they can access information on water and hygiene in addition to the access to safe drinking water. http://projectchild.ngo/wp-content/uploads/2016/11/egr.png 328 901 Marvin http://projectchild.ngo/wp-content/uploads/2016/03/Logo-Header.png Marvin2016-11-15 20:07:392016-11-15 20:07:39Our new team in Pacitan! A Visit From Gießen University In August 2015, 18 German students, accompanied by their Professor, visited Project Child. These students were studying education with a focus on geography, and their visit to Sekolah Sungai – the River School – was an integral case study on how geography and poverty can impact learning. During the visit, Professor Ulrich Scholz gave a general lecture on development at Gadjah Mada University for the Project Child volunteers, his students, and UGM students from the Geography Department. This lecture outlined why development is so important, and how geography plays a huge role in a society’s ability to develop. After the lecture, the 18 German students came to Kricak Kidul and visited the Sekolah Sungai. These students met with the children there and kindly generously donated a lunch to all of the children and team at Project Child. Finally, Project Child’s Director, Aya, gave a lecture on social work and how any professional skill set can aid underserved communities. She discussed her specialization in coastal and riverside communities, which are often the poorest geographic areas in both rural and urban contexts. Her research particularly pertained to ‘sea gypsies,’ traditionally nomadic peoples in Sulawesi who were forced into a sedentary lifestyle by a decrease in available land, and thus built houses on the sea. Their access to drinking water, sanitation, and education were extremely low. Development typically focuses on these lower-rungs of economic development, and any professional skill set can be beneficial in these communities, particularly those skills sets which pertain to education and teaching. Hopefully, this visit by Gießen University will help these German students develop their understanding of how geography and education correlates with alleviating poverty. Project Child thanks Professor Ulrich Scholz for his lecture, and for his students visit to Sekolah Sungai and Project Child Indonesia, we hope it will be beneficial to his students education. From August 13th to 15th, 2015, the football school, Renchtal, organized a children’s football camp on the sports grounds of the FV Rammersweier football club. There, the kids had the opportunity to prove their soccer skills under the eyes of qualified coaches. Not only did the coaches provide supervised training sessions and a mini-World Cup, but also individual trainings under special safety conditions. The fun and joy of the event reached it’s apex at the crowning finale, a common football game between children, coaches, and mothers. Additionally, Project Child Germany e.V., in tandem with FV Rammersweier, hosted a coffee and bake sale. In order to introduce the children and visitors to Southeast Asian cuisine, the sale also offered Indonesian cakes. For instance, Wingko, a special coconut cake, and a pandancake were offered. The income of the cake sale will be used for the construction of a football pitch on the ground of the beach school (Sekolah Pantai). Particularly surprising and pleasing was that at the end of the event, the football school Renchtal additionally donated 100, 00 € to Project Child. We would like to wholehartedly thank all persons who are interested in our programs, and of course to our donors. Special thanks go to the FV Rammersweier and the Football School Renchtal. Tenny Yanutriana is the Commissioner of BPR Surya Yudha, one of the best microfinance banks in Indonesia, and together with Project Child Indonesia we are undertaking a microfinance project to give PCI sustainable funding and improve the lives of the community in Kricak. Tenny took the team at PCI for a journey to Banjarnegara, where BPR Surya Yudha first started many of its successful microfinance loans. At Banjarnegara the PCI staff and volunteers participated in a microfinance workshop to understand how injections of capital can help women start up businesses and create sustainable income. This injection of capital partnered with education in finance management and increasing financial literacy gives people in vulnerable communities vital skills to overcome poverty. Offering these microloans will also help Project Child become a social enterprise. Currently our funding relies on donations, and is therefore not a stable income for our programs. By offering microloans with a small amount of interest, PCI can become self-sufficient and have a sustainable income to fund all of our programs. The transition from NGO to Social Enterprise is all about using what we have to sustain our social work, and we really hope with education, monitoring and small interest loans we can make PCI even bigger and better. Our partnership with Tenny is one of the most new and exciting ventures PCI has undertaken yet. We hope this leads to a sustainable future for our programs and even the expansion of our social work to help and reach more people! How did you come into contact with Project Child? I first met Aya in 2012, where she enthusiastically told me about Project Child. She described PCI, “from A to Z” and I became very interested in its programs and inspired by its objectives. It was not yet a formal NGO at that time; it was just a small community of young people with a vibrant, dynamic energy, which was put into doing great things for underprivileged children in Yogyakarta. I was inspired and moved, and so I decided to be a regular donator and, a year later, I offered to help Aya transform that community into a formal legal NGO. It was, at the same time, Aya’s birthday, so the timing was nice and the NGO became like a beautiful present. What inspires you to use your skills in banking and micro-finance for social work? I have been in the micro finance banking industry for the last 13 years of my life, and I definitely love what I’m doing, especially the combination of serving commercial and social purposes. I am frequently in touch with the middle-low income population, as they are my main clients, and I have seen with my very own eyes that giving them some capital injections, education and technical skills, as well as trust, has changed their lives for the better. They have more confidence in life as they earn more. Their children go to higher education, they live in better houses, their quality of life is increased, and they can be more beneficial for the society for they are being productive. It truly is a win-win situation for everyone. I would like to introduce micro finance into Project Child, with the objective of directly reaching the parents of these underprivileged children in the slum areas of Yogyakarta. It is my belief that if those parents could manage to increase their overall quality of life, it would have a direct — and profound — impact on the children. Other than that, connecting this micro finance initiative with Project Child’s future dream to evolve into a Social Enterprise will help it be sustainable in the long run. By becoming a Social Enterprise and generating capital independently, Project Child will not have to reply so much on donations and, thus, will become self-sufficient and be able to help children indefinitely. How long do you plan on working with Project Child? For me, Project Child is a life-long project. I helped giving birth to it and I’d love to see it grow bigger and better. This organisation is so heart-warming, and I love seeing how young people can work together for a good cause in the community. On that note, Project Child is also developing its Beach School in Pacitan in addition to its River School in Yogyakarta, so the future, I believe, is very BIG. There’s no way I wouldn’t be a part of that. More collaborations with new partners will be initiated, more programs will be added, more ideas, more volunteers, and — most importantly — more love. One of our recent excursions Project Child ran for the children at Sekolah Sungai was a cooking class at a local Jogja restaurant, Indochine Bistro. With some transport from our volunteers, the children visited Indochine and worked together with Mbak Stefanie to cook a variety of dishes that were both healthy and delicious. All the produce that was used for the meal was provided by Jogja Organic, who kindly donated a team of people to help us teach the children about healthy eating as well. The fresh fruits and vegetables from Jogja Organic helped them to educate the children on what organic food is. Through some songs and games Jogja Organic volunteers also helped teach the children about health and food. Next with Mbak Stefanie’s expertise, the children helped cut up, cook, arrange and decorate a variety of dishes that practically illustrated the kind of healthy food Jogja Organic talked about. A fresh chicken salad with cassava, cabbage, carrot, lettuce and grape tomatoes, sop buah (an Indonesian fruit salad) and potato people. This class was a fantastic way to have a practical lesson and teach the children the importance of healthy eating. Diabetes and other health issues are often prominent in poverty-stricken communities because of a lack of education about food. Thanks to the generosity of Indochine Bistro and Jogja Organic the children at Sekolah Sungai hopefully gained some knowledge about healthy food and had some fun practice cooking with our volunteers. On the 24th of May, 2015, Project Child helped 35 children and 10 parents from Kricak to have some of their first dental check-ups. This program was developed with the initiative of one of Project Child’s Volunteers: Pangky Fajar Sagita. Pangky is a dentistry student at Universitas Gadjah Mada and helped connect Project Child to the faculty of Dentristy there. Project Child believes every person can contribute to helping their community using their specific skills. Pangky really embodied this with this dental health checkup program by organising and integrating his skills for the purpose of development and social work. With his help, Drg. Dita came down to visit Kricak and do a risk assesment and cavity history check. With this new information, Project Child will be developing a preventative dental healthcare program for our community at Sekolah Sungai. The connection between dental hygiene and poverty is a serious concern for Project Child and the communities we work with. The results from the checkup were quite worrying, with 83% of children over 6 years old showing a high risk for new cavities. 57% of children under 5 years old also showed high risk for cavities along with 100% of the mothers who were examined. Some children had nearly a full mouth of decayed teeth, and while decayed adult teeth are a more serious problem – this is still an important issue to address. While the children’s dental hygiene can be tackled with education on how to brush their teeth and another screening in 6 months, some of the adults will need restoration. The reccomendation from Drg. Dita for the future is to on the prevention of dental cavities and thick plaque. Project Child ran a class with the children and some students from the UGM faculty of dentistry to teach them about dental healthcare, which was a huge success. Thank you to Pangky and Drg. Dita for offering their time and expertise for free to help our community in Kricak, this zero rupiah project is exactly how Project Child likes to run! In June 2015, we successfully started lessons for the children in Pacitan! Around 30 interested and curious kids from the neighbourhood appeared in front of our yellow office. The class took place in the open space in front of the office where the kids usually play basketball because we wanted to start the lessons as soon as possible and Sekolah Pantai won’t be open until August. Many parents were watching us interested and we had the chance to speak to them and introduce ourselves and our plans as well. Chica, our volunteer from Japan brought creativity and material from her home country, so we made dreamcatchers with the children. With some patience, explanation and help, every child could take one self-made dreamcatcher back home in the end. We all had a lot of fun and for the children, the mixture of handcrafting and english-vocabulary was a successful start full of laughter, that Project Child will offer in Pacitan from now on. The following day there was a big demand and a lot of children came early, well prepared with note books. Despite initial shyness we were able to see how good the general english-knowledge already is and how we therefore will continue the classes. At the end of the class, some enthusiatic children stayed longer to create a second dreamcatcher or to have a chat with us. We are thankful for this wonderful start in Pacitan and we are looking forward for everything that will come. Ayomi Pandanwangi is one of the children who attends our classes at Sekolah Sungai in Kricak, and she has a natural talent for painting. She has been painting since she was 3 years old, and has won many local competitions and prizes for her art. Despite her natural talent and passion for painting, Ayomi has never been able to have this talent nurtured and mentored. She has never been able to take a painting class or be given a formal education in painting and art. Since discovering her talent, Project Child Indonesia has been working to organise some art classes for Ayomi. Not only do we need to find her a teacher but we still need the funds to pay for these classes! Ayomi’s dream is to be a painter, but without some formal education in art, her talent and passion won’t be able to develop properly. This is why we are fundraising to help Ayomi achieve her potential. Please donate to Project Child and help us run our art-mentoring program through the Sekolah Sungai, to give Ayomi the opportunity she deserves. 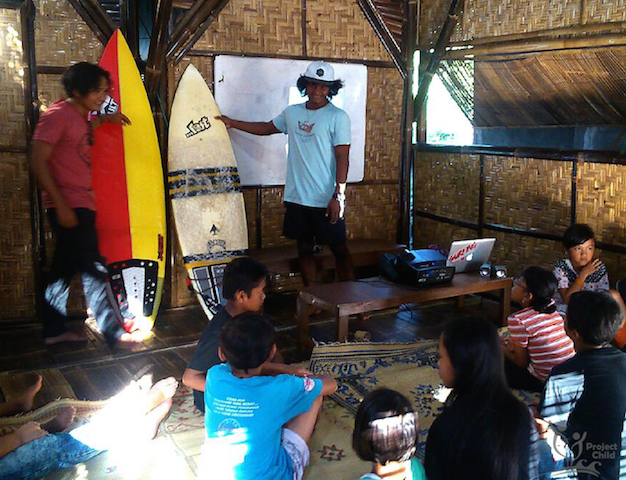 On Monday the 19th of May, our friends from Happy Surf Jogja paid a visit to our Sekolah Sungai in Kricak to teach the children about surfing and the beach. They even brought their surfboards and taught the kids the 3 important moves for surfing: paddling, taking off and popping up! Some of the children even had a go at simulating surfing, a new experience and learning curve for everyone. Happy Surf Jogja played a lot of the videos they have made about surfing in Jogja, how the beaches are undiscovered and how the surfing community is relatively new. Surfing as a sport is still not very common, and Happy Surf Jogja are keen to teach anyone, and get lots more people involved with the beaches to the South of Jogja. Pantai Krakal has very consistently good waves in the wet season, and the surf community also know all the places with rips as well as what beaches are good for beginners. Lastly, the kids were taught about the myths of Nyai Roro Kidul and the stigma around swimming at the beaches of South Java. Practices around this legend include never wearing green while swimming in the South Java beaches and praying before you swim. However, these myths were also supplemented with photos of rips and the beaches which are known to draw swimmers out to sea when they get too far away from the shore. This added aspect of science and myth combines Javanese mythology with swim safety to teach the kids that the beach can be dangerous if you don’t follow the rules or listen to those who know the waters. Thank you so much to Happy Surf Jogja for introducing this amazing part of Jogja to the kids, we hope one day they will be able to visit the beach with Happy Surf Jogja! Project Child is proud to report the opening of our office in Pacitan. The house, as seen on the picture, is a 2 minute scooter-ride away from the future beach school and will be used by our team to get in touch with the communities on site and start with planning our future programs. The house offers a living and working area, a kitchen and three rooms to accommodate up to 6 Project Child members. Thanks to the support and involvement of Ms Rian during the first steps of Project Child in Pacitan, we managed to get in touch with Mr Gatot who did the drilling of the fresh water fountain on the land of Sekolah Pantai. The 12 meter deep drill supplies us with high quality water. With this fresh water fountain we have fulfilled the first fundamental need for our future learning center. Next we will prepare to get electricity on our land.